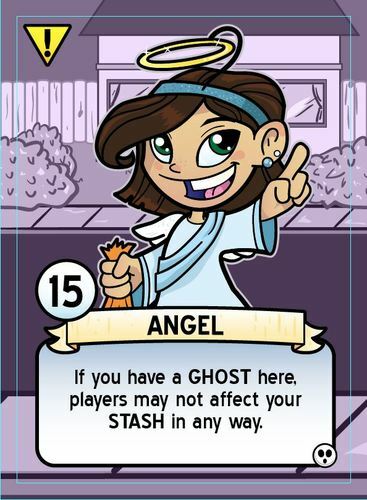 I learned about Ghosts Love Candy when I interviewed Danny Devine, the game’s designer, for his other design, Mob Town. Danny talked about the theme and premise of the game and it sounded interesting. But I didn’t realize it was so close to being completed. The Mob Town kickstarter had barely ended when I was sent me a review copy of Ghosts. And I am very glad they did so. Let’s start with the theme. Ghosts love candy. They really do. It’s just that they can never eat it. Because they are ghost and there are rules you know. Except on Halloween night. Then they can possess trick-or-treating kids and satisfy their sugary desire. Ghosts Love Candy is a hand management game at its core. Players have a hand of ghosts numbered 1 to 9. Each player also has a secret goal / scoring card. This card lists the types of candy in the game and the point value of that candy for that player. The most liked candy will score the most points at the end of the game and the least liked the least. And various in between. And the order of the list varies among the cards so that candy corn may be a high scorer for one player and a low scorer for another. Back to the ghosts. Players use these ghosts to bid on turn order each round. The player that played the highest numbered ghost gets to choose first onto which kid they will place that ghost. Players place ghosts on the kids to get the the candy that kid has. Turn order continues in descending order until all players have placed their ghosts and taken their candy. Then the next round starts. There’s a twist. Each kid has a special power. Player take these special powers when they place a ghost on a kid. These powers may allow you to take candy from another player. Or shift the kids around in the line. Or keep a kid from getting scared. Yep, these ghosts can scare the kids. How you ask? As I mentioned the ghosts have a number. The kids have a number also – a threshold number. If a player places a ghost on a kid and the sum of the ghosts on that kid equals or exceeds the kid’s threshold number, the kid is scared. Scared kids are put into the stash of the player whose ghost scared the kid and count as (-2) points at the end of the game. Because you shouldn’t scare the kids of course. At the start of each round, one piece of candy (candy cards)is drawn from the candy deck and is added to each kid. Kids that didn’t get ghosts placed on them in previous rounds will accumulate candy until some lucky ghost gobbles it up. The game continues until there is no more candy to draw from the candy deck. That sums up the game play of Ghosts Love Candy. The player with the most points wins. First, a look at the components of the game. Ghosts is basically a card game. There are 6 sets of Ghost cards. Each set has pictured a unique, named ghost and these are numbered 1 to 9. Each set is also a different color. There are Scoring (Love) cards that list the candy available in the game in differing order for each card. So on one card Gummie Bears will score 5 points, Peppermint 4, Licorice 3, etc.. These cards express the Ghosts’ ‘tastes’ in candy. There are Candy cards depicting the various types of candy available in the game – one type per card. And the Kid cards, each with a unique action. I’ll mention the art at this point. It’s wonderful. Danny has really nailed the whimsy of the theme with the kids and the ghosts. Each kid and ghost is unique and clearly rendered in a charming cartoon style. Charming. That’s the word. The art is richly colorful, distinct, and unique to this game. I’ll talk about the art a bit more later. That’s it for the components. I need to talk about Kid Powers a minute. Each Kid has a unique power that allows players to manipulate the rules somewhat. Some powers affect that Kid. Some affect surrounding Kids. Others affect the Ghosts or the Candy on or around them. It is the effective use of these powers that is the real meat of Ghosts Love Candy. Being able to combo them. Moving Kids or Ghosts around to mess with the other players. Swiping candy, keeping Kids from getting sick, moving your sick Kids to someone else’s stash are all potential options. This can be a really wicked game. Who will like Ghosts Love Candy? -casual gamers: the game’s theme and art will draw them in while the ease of play will hold them. 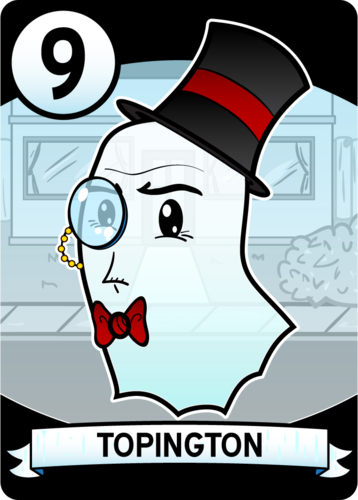 -filler lovers: Ghosts is quick and will take up to 6.
Who will not like Ghosts Love Candy? By now you know that I like this game. It is fun. It is quick. It makes an excellent filler because it has some strategy and ‘take that’. The art is super. ‘Charming’ was how I first described it. My gamer game group liked it also. My kids liked the game a lot. But they wanted to see more Kids come out. So they created a variant to do that. Here it is. Set up the appropriate number of Kids as usual. Play the first round normally. At the beginning of the next and subsequent turns, the last Kid in the row goes home and takes his candy with him. All the other Kids shift down one and a new Kid is drawn and placed in the first spot.This variant introduces some cool decisions. It is possible for the Kid that is leaving to collect a lot of candy before he leaves. Do you let him get to the end, hoping to gobble up a lot of candy at once. Or do you clean him out before? If you want to use his power you better do it fast because he is leaving soon. This variant adds some neat decisions. Anyway, I recommend this game. It’s a must for Halloween gaming. 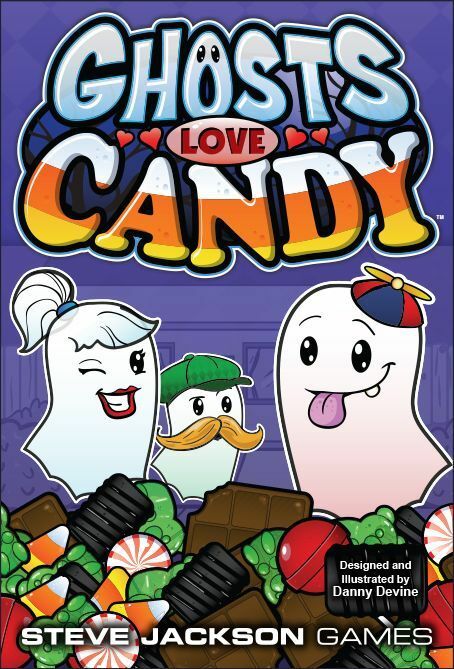 Ghosts Love Candy is published by Steve Jackson Games. THANK YOU!